What Is Fueling NVDA’s Record-Breaking Earnings? Fiscal 3Q17 was the first full quarter that reflected NVDA’s Pascal GPU sales. The company reported record-high revenue growth in its Gaming segment, which crossed the $1 billion mark for the first time. NVDA’s DC segment surpassed ProV to become the company’s second-largest segment by revenue. The company’s non-GAAP2 operating margin crossed 40% for the first time, and its EPS more than doubled sequentially—its highest growth reported to date. The company also reported a strong outlook for fiscal 4Q17. Such strong earnings boosted NVDA stock 30%, or $20, in just one day. 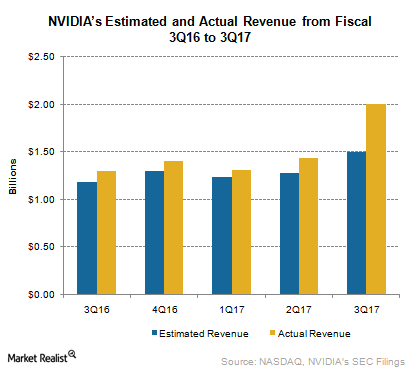 What pushed NVDA’s fiscal 3Q17 earnings to a record high? NVDA’s fiscal 3Q17 performance was fueled by the launch of its revolutionary Pascal GPU. ・The timing of the launch was in sync with the launch of several AAA games that demanded better graphics and the emergence of VR. ・ Moreover, NVDA’s notebook GPUs performance was on par with the performance of its desktop GPUs. Rival AMD launched the Polaris GPU, but its performance did not measure up to Pascal. AMD launched these GPUs for $199 in order to target mainstream customers. In response, NVDA launched a cheaper version of its Pascal GPUs that helped it win orders from mainstream customers as well. Instead of losing market share from AMD, NVDA regained some market share. The two rivals reported contrasting earnings. While NVDA posted record-high revenue and profits, AMD reported losses in the GPU segment despite revenue growth. NVDA’s record-breaking earnings were immediately followed by the SC16 on November 18, 2016. At the conference, NVDA announced its partnership with Microsoft and IBM in the field of AI. NVDA also unveiled the world’s most energy-efficient supercomputer, DGX SaturnV. This sent the company’s stock to an all-time high of $94.79 on November 17, 2016. 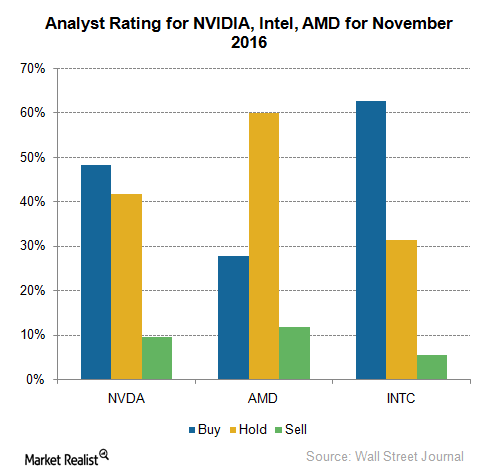 Many analysts are bullish about NVDA and believe the stock has more upside potential, whereas some analysts are cautious and expect the stock to pull back. In this series, we’ll look at NVDA’s growth catalysts and their impact on the company’s current and future earnings. 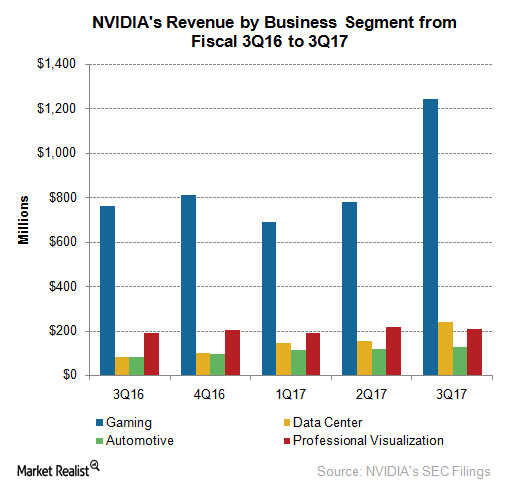 Can NVDA Break Its $2 Billion Revenue Record in Fiscal 4Q17? In the previous part of this series, we saw that NVDA reported record earnings in fiscal 3Q17, driven by strong demand for its Pascal GPUs. These earnings were significantly better than the analysts’ and the company’s own expectations. The company expects its revenue to grow further in fiscal 4Q17 as it witnesses strong growth in three of its four growth segments. Fiscal 3Q and fiscal 4Q are seasonally strong quarters for NVDA, as its core Gaming business gets a significant boost from holiday season sales. However, fiscal 3Q17 has been a special quarter for the company as it reported 63% YoY growth, as its revenue reached $2 billion, 25% higher than the analysts’ consensus estimate of $1.5 billion. NVDA earns 85% of its revenue from GPUs. These record earnings resulted from a 53% YoY increase in GPU sales, mostly driven by demand for Pascal GPUs. According to data from JPR, NVDA’s GPU shipments rose 39% sequentially in the September 2016 quarter, whereas AMD and Intel’s GPU shipments rose 20% and 18%, respectively. NVDA has been diversifying its GPU technology from its Gaming segment to other fast-growing businesses such as its DC, AUTO, and ProV sectors. The company has increased its exposure in these markets from 81% in fiscal 1Q16 to 91% in fiscal 3Q17. It reported 59% sequential growth in its Gaming and DC segments, driven by Pascal GPUs. NVDA stated that Pascal is one of its most successful launches to date. According to NVDA’s 2016 Investor Day, it took gamers three years to switch to Maxwell GPU and still, 70% have not yet upgraded. This indicates that growth in Pascal sales is here to stay for a few years. What Is Driving NVDA’s Profit Margins to New Highs? In the previous part of this series, we saw that NVDA reported record-high revenue of $2 billion in fiscal 3Q17 and expects to report $2.1 billion in revenue in fiscal 4Q17. This strong revenue growth trickled down to strong profits, driven by demand for NVDA’s high-end, high-margin Pascal GPUs. On a non-GAAP basis, NVDA reported record-high profit margins and EPS in fiscal 3Q17. As seen in the above graph, AMD’s non-GAAP gross margin rose to a record high of 59% in fiscal 3Q17. The company shifted from TSMC’s 28nm node to 16nm node, which improved yields and delivered cost benefits. Some media reports stated that NVDA is switching its GPU production to Samsung (SSNLF), hinting at supply problems with TSMC. In the company’s fiscal 3Q17 earnings call, NVDA’s president, Jen-Hsun Huang, stated that the company would continue with TSMC. NVDA expects to maintain its gross margin at ~59%–59.2% in fiscal 4Q17. We saw a major spike in NVDA’s non-GAAP operating margin, which rose from 26.8% in fiscal 2Q17 to 42.1% in fiscal 3Q17. In dollar terms, it means a $326 million increase in just one quarter to $708 million. On the flip side, rival AMD reported operating income of just $70 million. NVDA increased its operating expenses by 7% Q/Q to $478 million as it increased its R&D expense in DL. The company spent more on selling and marketing new products. The company would continue to spend more on R&D as it looks to tap the DL market. For fiscal 4Q17, it expects to report non-GAAP operating expenses of $500 million. However, this would not hamper its operating margins, as the 4.6% sequential growth in expenses is likely to be offset by 5% sequential growth in revenue. Thus, its fiscal 4Q17 operating margin is likely to be ~42%. 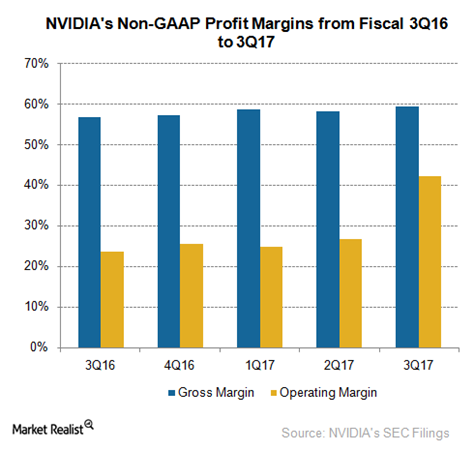 With its record-high margins, NVDA’s non-GAAP EPS more than doubled from $0.44 in fiscal 3Q16 to $0.94 in fiscal 3Q17, 68% higher than analysts’ consensus estimate of $0.56. These strong profits are a result of NVDA’s transition of its GPUs to high-growth profitable markets. Next, we’ll look at NVDA’s transformation from a small GPU supplier to a market leader in the dGPU space. The GPU is NVDA’s core product, accounting for 85% of its revenue. In fiscal 3Q17, GPU revenue rose 53% YoY to $1.7 billion, driven by strong demand for Pascal GPUs in its Gaming and DC segments. The company’s share in the GPU market also rose, whereas Intel and AMD lost market share in 3Q16. According to data from JPR, overall GPU shipments rose 20.4% Q/Q in 3Q16, with NVDA reporting 39% growth, followed by AMD at 20% growth and Intel at 18% growth. JPR’s data showed that dGPU shipments rose 35.6% Q/Q in 3Q16. The growth was mainly driven by an increase in demand for gaming desktops and notebooks. Plus, 69% of gaming GPUs sold were for PCs and only 31% were for consoles. dGPUs are used in gaming desktops and notebooks, and Intel does not make such GPUs. On a sequential basis, NVDA’s desktop dGPU shipments rose 39.8%, and notebook dGPU shipments rose 38.7% in 3Q16, according to JPR. Both desktop and notebook GPUs reported similar growth as the Pascal notebook GPU performance was on par with that of its Pascal desktop GPU performance. However, this was not the case with AMD, as the launch of its AM4 chips was delayed. 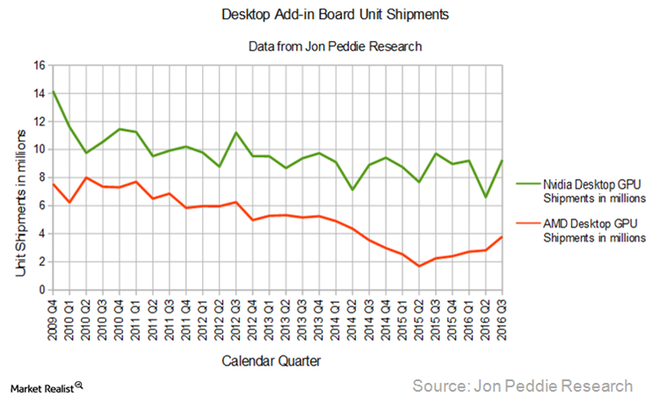 Hence, its desktop dGPU shipments rose 34.7% sequentially, whereas notebook dGPU shipments rose 23% sequentially in 3Q16. It’s important to note that the above research data only includes GPUs used in PCs, notebooks, and tablets. This research excludes NVDA’s GPUs used in DC and AUTO uses, as these are new applications for the GPU that were developed by the company. AMD is also expanding its GPU applications in the DC space. It recently partnered with Google to supply GPUs for the latter’s cloud platform. What Is the Growth Catalyst for NVDA’s Tegra Processors? In the previous part of this series, we saw that NVDA reported the highest growth in GPU shipments and gained market share from Intel and AMD during 3Q16. There is a huge R&D gap between AMD and NVDA. In the September 2016 quarter, AMD spent $259 million in R&D across its vast portfolio of GPUs, CPUs and APUs (application processing units). On the other hand, NVDA spent $373 million only on GPUs. This gives NVDA an edge over AMD in the GPU market. One area where AMD overpowered NVDA was the game console market. However, this is about to change as NVDA makes its entry into the game console market with Tegra processors. NVDA has won an order from Nintendo to power its next game console, NX Switch, which is expected to launch in March 2017. Until now, AMD powered Sony’s PlayStation4, Microsoft’s Xbox One, and Nintendo’s current game console. However, NVDA has won the order from Nintendo, which will be powered by NVDA’s Tegra processor. In the past, NVDA used its Tegra processors to power tablets. However, it withdrew from the smartphone and tablet sector due to strong competition from Qualcomm. NVDA has been looking at new applications for its Tegra processor and started using it in its AUTO platform, DRIVE PX 2, in fiscal 4Q16. In October 2016, Tesla Motors (TSLA) announced that it would feature Tegra-powered NVDA DRIVE PX 2 in its Model S, Model X, and the upcoming Model 3. NVDA has started full production of the DRIVE PX 2 platform to meet the large order volume coming from Tesla. 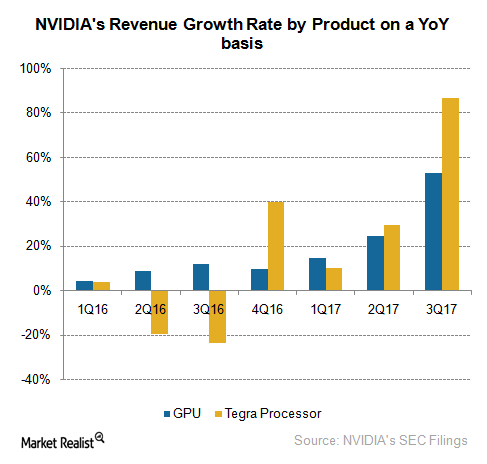 This saw NVDA’s Tegra processor revenue increase 87% YoY to $241 million in fiscal 3Q17. The order volume for Tegra is expected to increase further in fiscal 2018, when Tesla launches its Model 3 car. This would enable Tegra to see higher revenue. Next, we’ll look at NVDA’s four end markets and the factors driving growth in each of these markets. 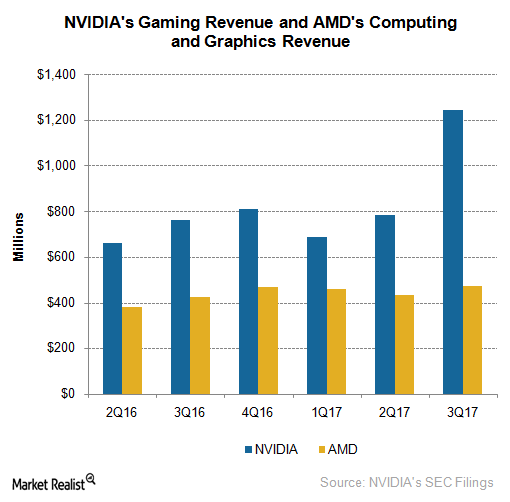 NVDA is enjoying the afterglow of record earnings and an even brighter future, thanks to the success of its Pascal GPU in the Gaming segment. This time, it’s not just the PC gaming that could generate revenue for NVDA. The game console market could also contribute to its revenue growth, as the company secured orders from Japan’s Nintendo for its new NX Switch console. This is a major loss for AMD, which had previously powered Nintendo’s game consoles. Fiscal 3Q17 was the first full quarter in which Pascal sales were reported. During the quarter, NVDA launched various versions of Pascal GPUs, and all were a big hit among consumers. The first Pascal GPUs in gaming were the GeForce GTX 1080, 1070, and 1060. These GPUs were VR ready. In October 2016, NVDA launched the desktop version of Pascal—GeForce GTX 1050 and GTX 1050 Ti. These were cheaper variants of the Pascal GPU, priced at $109. These variants compete directly with AMD’s Polaris GPUs RX 480 and 470, which were priced at $199. This removed the pricing edge AMD had in the gaming market. NVDA’s highest-end gaming GPU, Titan X, is priced at $1,200 and reported strong sales. During its recent Investor Day, NVDA stated that 70% of the consumers in the gaming market have not upgraded their PCs. Pascal’s predecessor, Maxwell, was adopted by gamers over a span of three years, and Pascal has just launched. It may take time for gamers to switch to Pascal, indicating a long-term demand for the new GPU. All of the above factors gave the revenue for NVDA’s Gaming segment a 63% YoY boost to ~$1.2 billion. This revenue boost increased the Gaming segment’s contribution to the company’s revenue from 58.3% in fiscal 3Q16 to 62% in fiscal 3Q17. In contrast, AMD’s Computing and Graphics (or CG) segment, which includes GPUs and PC CPUs, reported 11% YoY growth in revenue to $472 million. The respective growth figures of 11% and 63% show the success of Polaris versus Pascal. In dollar terms, NVDA’s gaming revenue grew by $483 million in fiscal 3Q17, which exceeded AMD’s total CG revenue of $472 million. 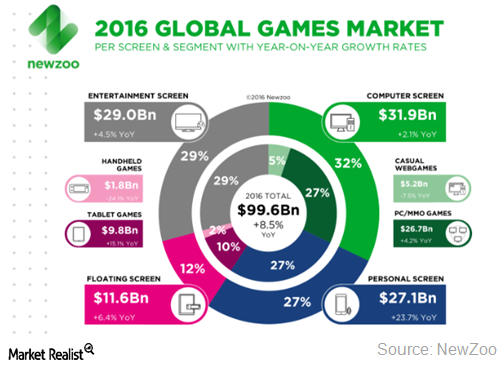 These figures indicate the increasing difference in the size of the two companies in the gaming space. Next, we’ll see how the NVDA–AMD competition unfolds in fiscal 4Q17 and fiscal 2018. NVDA or AMD: Who Could Win GPU Market Share This Quarter? How could the December 2016 quarter look for NVDA and AMD? In the previous part of the series, we saw that NVDA outperformed AMD with its high-end Pascal GPUs. The two companies adopted two different strategies. While AMD focused on low-end, portable GPUs for mainstream gamers, NVDA focused on high-end, high-performance GPUs for advanced gamers. Despite this, NVDA’s Pascal was more successful than AMD’s Polaris. A survey by Steam, the dominant PC gaming platform, shows that only 0.28% of Steam users used AMD’s RX 480 while 25% of Steam users used NVDA’s GTX 1070. Things are likely to get tougher for AMD in the December 2016 quarter as NVDA enters the mainstream market with its GTX 1050 and 1050 Ti GPUs, giving direct competition to AMD’s RX 480 and 470. A recent report by JPR showed that the gaming market is lifting the PC demand. Research by NewZoo showed that PC users would account for 32% of the global gaming market in calendar 2016, whereas console users would account for 29% of that market. NVDA dominates the PC gaming market, and AMD dominates the game console market. Despite the launch of the Polaris GPU, AMD’s revenue growth was mostly driven by seasonal demand for semi-custom chips from game console makers. NVDA is currently making inroads into the console market with the Nintendo win. 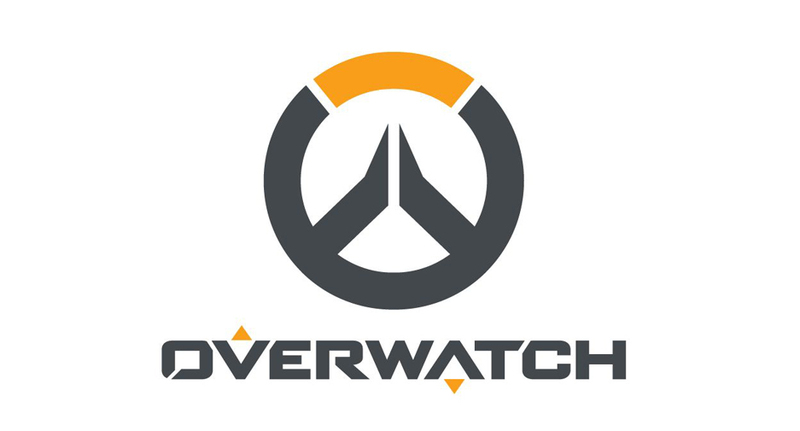 NVDA stated that consoles like Sony’s PlayStation, Microsoft’s Xbox, and Nintendo’s Switch, as well as PCs, have the same basic architecture. This makes it easier to port games between consoles. As game console technology improves, the architecture types are expected grow closer to that of PC gaming, as they all use modern GPUs and programmable shading. This would enable developers to use a common code to develop games for all platforms. However, this could make the game console market more competitive as the concept of customization would fade. With NVDA GPUs being more efficient than AMD’s GPUs, AMD could face tough competition with NVDA in the game console market. While NVDA enters AMD’s market, AMD is entering NVDA’s market. NVDA dominates the GPU application in AI, and AMD is eyeing this market. AMD recently secured orders from le to supply GPUs for the latter’s cloud platform. Moreover, AMD is expected to launch a high-end Vega 10 GPU in fiscal 1Q17 that would compete with NVDA’s high-end Pascal GPUs. However, it remains to be seen if Vega can help AMD win back share in the GPU market from NVDA. Next, we’ll look at NVDA’s DC segment and factors driving growth in this space. What Led to Growth in NVDA’s DC Segment? In the previous part of this series, we saw that NVDA excels in its core product of gaming GPUs. For years, the company has been working to transform its graphics processors to general purpose processors by shifting to a platform model. This has helped it shift to new paradigms for its DC and AUTO sectors. These efforts started to materialize in fiscal 2017 as more cloud companies and supercomputers started using GPUs for their AI functions. As seen in the above chart, NVDA’s DC revenue has increased threefold from $82 million in fiscal 3Q16 to $240 million in fiscal 3Q17, accounting for 12% of the company’s revenue. The segment witnessed strong demand in every area: AI, supercomputing, GRID, and virtualization. NVDA reported strong demand from cloud service providers such as Amazon Web Services, Microsoft Azure, and Alibaba Cloud for their AI needs. Moreover, fiscal 3Q17 revenue also included sales of the DGX-1 AI supercomputer. NVDA has shipped the DGX-1 to major universities, research groups, and multinational companies. What’s new in NVDA’s AI portfolio? 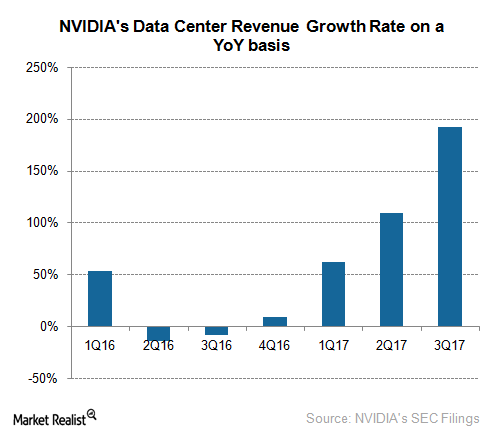 The growth in NVDA’s DC segment is likely to continue in fiscal 4Q17 as more companies adopt AI. This growth would be further fueled by NVDA’s newly launched Tesla P40 and P4 GPUs. NVDA has also launched TensorRT DL framework, which would accelerate the training process, as well as AI production workloads in hyperscale DCs. NVDA’s president, Jen-Hsun Huang, said that the benefit of GPU acceleration in the DC space is not just 20% or 50%—it is 20x–50x. The growth that NVDA has started to report in its DC segment is just the start. The company notes that it is likely to grow exponentially as the connected world leads to a data explosion. This dramatic increase would create the need for real-time analytics and AI in almost all fields, including finance, healthcare, retail, and transportation. NVDA has already started moving in this direction, with a variety of partnerships and next-generation technology. We’ll explore this initiative in the next part of the series. How Could NVDA Increase Adoption of AI across Verticals? In the previous part of this series, we saw that NVDA is seeing increasing adoption of GPUs by supercomputers and cloud companies for their AI tasks. NVDA is now moving to the next generation of AI. At the SC16 (Supercomputing Conference 2016), the company debuted its first in-house supercomputer, the DGX SaturnV. NVDA’s first in-house supercomputer. The DGX SaturnV contains 124 DGX-1 servers, each of which features eight P100 GPUs. The DGX SaturnV ranks 28th on the list of the world’s top 500 supercomputers. Delivering ~9.5 gigaflops per watt, the SaturnV is 42% more energy efficient than the most efficient supercomputer on the top 500 list. This has made the SaturnV the most energy-efficient supercomputer in the world. The DGX SaturnV’s striking features have attracted attention from SAP, Open AI, and Benevolent AI. NVDA is using the SaturnV to analyze its chipset designs and compose the software for DRIVE PX-2. NVDA has also partnered with IBM and Microsoft to accelerate the adoption of its GPU technology for AI tasks in the enterprise space. In its partnership with IBM, NVDA would connect its four Pascal P100 GPUs directly to the IBM POWER8+ processors. NVDA would use its NVLink fabric to accelerate the data transfer at a speed of up to 80 GBps of bandwidth, which would speed up the training of neural networks for DL.NVDA would also launch a new suite of PowerAI software that would eliminate the need for reconfiguration. In partnership with NVDA, Microsoft would use the former’s Pascal GPUs to accelerate its Cognitive Toolkit, or CNTK, used for training computers on machine learning. Microsoft and NVDA have created a set of DL algorithms and libraries to accelerate CNTK’s speed to perform AI tasks. Apart from its enterprise initiatives, NVDA is expanding its GPU technology in the fields of healthcare and energy. It partnered with the National Cancer Institute and the US Department of Energy to speed up the latter’s AI software, Cancer Distributed Learning Environment (CANDLE). NVDA would use the DGX SaturnV in this project. Looking at the growth opportunities presented by the AI market, Intel and AMD have also entered this space. However, they lag behind NVDA in terms of technology. Next, we’ll look at the outlook of AI and the growth potential it offers to all three GPU providers. In the previous part of this series, we saw that NVDA is making efforts to increase the adoption of AI in enterprises. According to market intelligence firm Tractica, AI would become a part of every industry, replacing the existing business models with new ones that rely on DL. 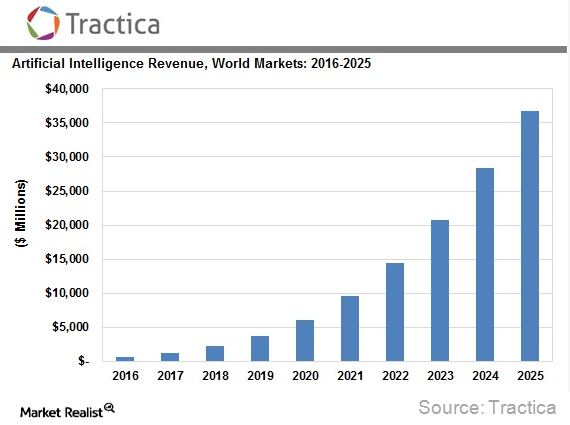 Tractica forecasts that global AI revenue could grow from $643.7 million in 2016 to $36.8 billion by 2025.The increasing adoption of AI could see other companies such as Intel and AMD create their own versions of accelerators. However, they would have to do a lot of work to develop a large ecosystem to equal the one that NVDA has built over the years. Intel aims to develop chips that deliver 100x better AI performance than that offered by GPUs by 2020. Intel would most likely use the FPGA (field programmable gate array) accelerator, which can deliver far better performance and energy efficiency than GPUs. Intel is currently developing DL chips Lake Crest and Knights Crest in collaboration with Google. The chip maker would use the technology of its recently acquired AI startup Nervana Systems to manufacture these chips and optimize them for Google’s TensorFlow AI software. Intel would test its Lake Crest chipset in fiscal 1H17 and make them available to customers by the end of fiscal 2017. NVDA’s president, Jen-Hsun Huang, does not count Intel as a competitor, as there is a difference in the FPGA and GPU technology. He explained that FPGA are meant for custom applications as opposed to general purpose use. On the other hand, NVDA aims to create a general purpose parallel processor with its GPU technology that can handle all types of workloads. While Intel is looking at FPGA technology, AMD is looking to compete with NVDA with GPU accelerators. AMD launched a FirePro GPU for high-performance computing. However, the product was not well-received because AMD’s GPU software was designed for Microsoft’s Windows. Plus, server applications requiring data acceleration used Linux and other systems. Returning to the AI space, AMD has launched its Radeon Open Compute Platform, which eliminates the need for developers to port their code to OpenCL to run on AMD GPUs. Although AMD has the required software in place for DC applications, its hardware still lags behind NVDA’s hardware. 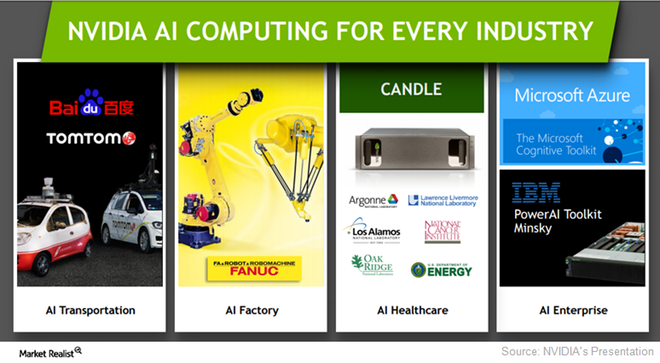 Mizuho Securities analyst Vijay Rakesh stated that the fast-growing AI market would give sufficient business to all three GPU suppliers: Intel, NVDA and AMD. Next, we’ll look at another upcoming segment for NVDA—AUTO. 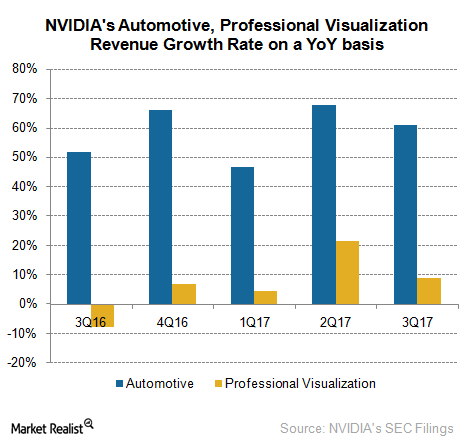 Could AUTO Be NVDA’s Next Growth Driver? Earlier in this series, we saw that NVDA is finally seeing the result of its years of efforts in bringing GPU to AI. The DC segment has grown to become NVDA’s second-largest segment after the Gaming segment. Another upcoming segment is AUTO. This segment could grow once self-driving cars hit the road. The segment has started seeing the first signs of its efforts materializing, as it secured orders from Tesla (TSLA) for its DRIVE PX 2 open AI car computing platform. In fiscal 3Q17, revenue from NVDA’s AUTO segment rose 61% YoY to $127 million, accounting for 6.4% of the company’s revenue. The revenue was largely driven by demand for car infotainment products. The company has developed an integrated AI platform, DRIVE PX 2, which can be scaled from a single SoC (system-on-chip) for automated highway driving to multiple SoCs for fully autonomous driving. The company has been testing this platform with multiple automakers and has won its first order from Tesla. NVDA’s DRIVE PX 2 platform would be featured in Tesla’s Model S, Model X, and the upcoming Model 3 cars. This means the DRIVE PX 2 platform could start contributing toward NVDA’s earnings starting in fiscal 4Q17, driving its AUTO segment’s revenue to new highs. NVDA has collaborated with China’s Baidu and the Netherlands’s car navigation technology provider TomTom to develop a cloud-to-car HD mapping system. NVDA is also developing Xavier, the successor of DRIVE PX 2 platform. The 8-core ARM 64-based processor would house 7 billion transistors on one chip, perform 20 trillion operations per second, and support dual 8K HDR (high dynamic-range) video recording—all with just 20 watts of power. While things have been hot for the AUTO segment, NVDA’s ProV segment has been a little slow. The YoY growth slowed from a record high of 21.6% in fiscal 2Q17 to just 9% in fiscal 3Q17. The demand is slowly picking up as NVDA receives interest from a variety of businesses, such as digital entertainment and AUTO companies, as well as architectural, engineering, and construction companies. As more industries adopt VR–AR (virtual–augmented reality), the ProV segment’s revenue could grow. It is difficult to predict how the segment could perform in the near future, as the demand is directly proportional to the adoption of VR–AR. Next, we’ll see how much cash these four high-growth segments are earning for the company. What Does NVDA Plan to Do with Its Strong Cash Flows? In the earlier few parts of this series, we saw that NVDA is successfully implementing its GPU technology in its high-growth segments of AUTO, DC, Gaming, and ProV. This has increased the company’s R&D expense, but it has also increased its margins as adoption rates improved. NVDA has a stronger balance sheet than rival AMD. However, NVDA’s balance sheet size is just a drop in the ocean when compared to tech behemoth Intel. 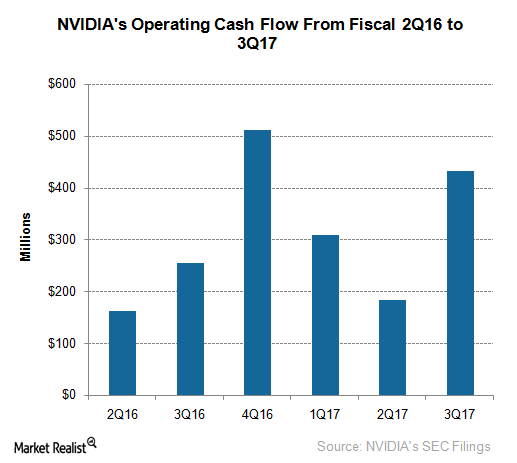 In fiscal 3Q17, NVDA’s operating cash flow surpassed $400 million, well ahead of AMD’s cash flow of $29 million. Meanwhile, Intel’s operating cash flow stood at $5.8 billion during the same quarter. NVDA’s cash flow was driven by improved profit margins and revenue. The company is looking to pass on the benefits of improved margins to its shareholders. NVDA has increased its dividend from $0.115 to $0.14 per share. Moreover, the board has authorized an additional $2 billion in its stock repurchase program through the end of 2020. Over the past four years, NVDA returned around $1 billion to its shareholders in fiscal 2013 and 2014. It then reduced this amount to $800 million in fiscal 2016 to invest in the business. So far in fiscal 2017, the company has returned $694 million to its shareholders, and this figure may cross $800 million by the end of fiscal 2017. For fiscal 2018, NVDA plans to increase shareholder returns to $1.2 billion, indicating its confidence in future cash flows. On October 30, 2016, NVDA’s cash reserves reached ~$6.7 billion from ~$4.9 billion at the end of fiscal 2Q17. During the quarter, the company raised $2 billion in new debt to pre-fund the repayment of principal amount of convertible notes due in 2018. The company is not willing to use its strong cash reserve for this purpose, as 75% of this reserve is held overseas. Moreover, it is pre-funding the repayment as interest rates are likely to increase. US President-elect Donald Trump is looking to encourage companies like NVDA to repatriate their overseas cash by paying a tax of just 10% instead of the current 35%. If Trump implements this policy, NVDA would be better positioned to use its cash for long-term growth. NVDA’s overall financial position is strong, which is reflected in its stock price. In the final part of this series, we’ll look at the company’s stock performance. In this series, we saw that almost all of NVDA’s segments are on a growth trajectory. The company’s short-term and long-term outlook seems bright as the world moves toward IoT, VR, autonomous cars, and AI. While rivals Intel and AMD are picking up, they lag far behind NVDA in terms of technology. This vision was shared by NVDA in its most recent quarterly earnings and the Supercomputing Conference 2016 (or SC16). NVDA’s growth strategy and its record-high earnings saw its stock rise in the past few days, gaining more than $25 in just one week. In October 2016, Wall Street analysts kept an average price target of $68.00 and a bullish target of $85.00 for NVDA stock. However, NVDA stock surpassed even the bullish target and hit an all-time high of $94.79 on November 17, 2016. Now, NVDA has a bullish target of $100 and a median target of $87. Rival AMD recently surpassed its bullish target of $9.00 after it was revealed that Google would use AMD’s GPUs for its cloud platform. On the other hand, Intel did not even meet its average price target of $40. After such a breakthrough performance, several analysts have upgraded their rating on NVDA to “buy” at a price exceeding $90. Analysts believe that the stock has a large upside potential. Needham analyst Rajvindra Gill noted that NVDA has tripled its DC revenue in just one year, driven by the increasing adoption of AI by cloud service providers such as Microsoft and Amazon. Moreover, the emergence of VR is driving the demand for graphics content. NVDA has also made inroads（進出・侵入） in the autonomous car field, with the upcoming integration in Tesla Motors’s (TSLA) future cars. While some analysts raised their ratings and price targets for NVDA, some remained cautious. Since the start of 2016, NVDA stock has grown 187% from $32.37 to $92.98, whereas rival Intel’s stock grew just 3%. After such a strong growth trend, some analysts expect the stock to pull back before growing again. Some analysts would recommend a “buy” under those conditions. Yahoo finance company of the year!